One that also came up in a session with a client that also knows about the Eclipse- just this week. S. Carlos how goes the Eclipse? When is it going to happen? C. It can happen any time. But what you might want to know is that The Eclipse was not my idea- it was Destiny’s idea. I just get do it. C. But this week I had a chat with Destiny, and Destiny told me 32/32. Yes. That’s what I saw. C. Meaning I was 32 when I won the State Championships in 1980. And this November it will be 32 years from that date. Add them together (32 and 32) and that will be my age now. Twice the years- twice the age. I know this language- this is how Destiny speaks to me. So my target date for the final landing of the Eclipse will be this November. S. You know what the Eclipse has working against it….. don’t you. C. You would say time. S. (laughter) That’s right- my friend……. time. Time may not be on your side! I still feel like I’m supposed to do this. I am supposed to beat the unbeatable, the undefeated. (The guy who was known to be ferocious in the gym. The guy who was willing to do what ever it took to win. La Maquina, The Extreme) The only thing (or one) that could prevent that is me. I will be blogging from time to time, and even put up pics but I will be ready on 32/32. The whole month of June Sue has been competing in a series of races in preparation for the National Championships this August. June 3rd was at Naylor’s Beach VA, an Olympic Distance Triathlon. June 10th was in Maryland, The Eagleman Aqua Velo (swim/bike) ½ Ironman distance- The Mid Atlantic Championships. June 26th was the Peluso 1500 meter open water swim race (which actually turned out to be 1800 meters) and a PB for Sue! In All of these she won in her age group and sometimes a few age groups younger. Two weeks ago she won a swim/bike- the USAT National Championships. which put her in a national champion status for the second time that month. This past weekend she won the triathlon at Colonial Beach Va in her age group- second place came in 48 minutes after her. She will be ready for the nationals. She seems to get better with each race and that got me thinking about the fact that I have not competed for 32 years and could possibly have a little “ring rust”. When I was competing I would sometimes compete several times a year- and in the process of “Peaking Out” that often I developed a competitive edge- an appearance that reflected the cumulative effect of staying in competition shape that would be difficult to otherwise reproduce. Is this an excuse? Actually it’s a realization, and one that I really need to take in consideration to make the Eclipse possible. I will factor this into my preparation as I approach 32/32. The following are email correspondence with friends. Their questions or comments are in bold. I just finished with my most recent project. It has been on the back burner for too long- so I now have almost finalized the new plans for the Wooden Gym. If body weight is any barometer- when I was discharged from the Military in November of 1970 I weighed 205 pounds at 21 years of age. This morning at 7 am April 5, 2012, I weighed 200 pounds down about 16-18 since last year. I am ……maybe 5 pounds from my competition weight at the World Championships in 1985. Of course- you and I know that its the composition not the scale weight that counts. I would say I am close. Just checking in with you Carlos. This week (Monday) began with me “suiting up” and warming up in my studio with my normal 5 minute ride on my ergometer. My normal warm up and stretch ritual. After this (for some reason) I took an inventory of how my muscles and joints were feeling. The thought that came to mind was to take a week off from training (but not from proper nutrition). Tuesday was the same, and so was Wednesday. (I did ride the ergometer for 25 minutes on Tuesday and Wednesday) Thursday I was wondering if I should train or not and after the warm up- my body said the same thing as Monday. I was just telling one of my clients on Friday that this has been a tough week. Not because of the training- but because I wasn’t training! I can’t remember the last time I took a whole week off, and I am so looking forward to Monday’s workout! At one point we think of discipline as consistency in training. In my head (cerebrally) I knew I needed the rest- but my body had to make adjustments to come into acceptance and in agreement and conformity with what my spirit and brain had already come to realize and understand. I know I have done the right thing because I am feeling refreshed overall- but for a disciplined athlete it was almost an ordeal! I think where most go wrong when the body needs time out is that they do not continue with proper nutritional practices. I have not gained or lost weight but I do feel better and I am looking forward to getting into the gym. I will have to “ask more questions” as to how I should structure my workouts. I am not assuming anything from this point forward. So I guess yes and no makes sense now— right? much I can do, when I set my mind to it. Yes. I remind my clients constantly that they are much stronger than they think. I have an 80 year old that started working with me about 5 years ago and at that time he was bench pressing with 35 pounds. This week (to his great surprise) he completed 12 reps with 90 pounds! I reminded him how he is breaking all the rules and the mentalities of all the wise men who talk of decline with age. If aging means that we lose function and strength- not only has he arrested what we sometimes define as aging, he has actually reversed it! I was just looking at your blog and it appears you haven’t posted in quite some time. I hope you are healthy, all is well, and that you are still working at or have achieved your goal. I have been very busy getting ready for the next photo shoot. I was going to post some thoughts I had made notes of over the past few weeks, but its just like getting ready for a contest (which is really what it is) so energy is low. I will have a professional photographer coming over to my studio to take the Eclipse pictures. I am still totally in and working hard at it. I will post something soon. Hope you are having a great morning! This morning as I was heading out for my first walk I began to think about the Eclipse. And the fact that I had set a goal, and that goal had a time frame. Suddenly I began to feel pressure, and I realized that I was not in a place of my default, which for me is peace. I began to pray and become thankful for all that I had and all that can happen,and I began to feel better then it occurred to me that this is probably what happened to a friend back in 2008 when he thought he failed because he had set a goal with a time frame and realized he would not achieve it within that space of time. It is a powerful practice to set goals. Especially if they are realistic. Then we can tell others about our dreams and aspirations and that can introduce a type of accountability, and that can be good and helpful as well. But if what starts out as a voluntary positive pressure measure becomes a negative stress- then for me that’s not good. How about you, reader? “I think that you set a very lofty goal. “…Which brings me to rule number 4 which is; Don’t Listen To The Nay Sayers. I love it when someone says, that never- no one has ever done that before, because when I do it that means that I’m the first one that has done it. So pay no attention to the people that say it can’t be done. I never listen that you can’t. I like what Keith said and I like what Arnold said. Now having said that- its back to the gym! So who or what influences those who tell you what to do? Some coaches say they rely on science. The word science comes from the Latin “scientia,” meaning knowledge. Simply stated- scientists are searching for the truth! Is a term used in U.S. political and legal disputes that brands an advocate’s claims about scientific data, research, or analyses as spurious. The term may convey a pejorative connotation that the advocate is driven by political, ideological, financial, or other unscientific motives. Therefore what the majority of (drug using) professional Bodybuilders are doing “scientifically” may be of no value to you at all. Over a period of time- I have discovered what works for me. It is not anyone’s system- it is as I have said- a discovery. So how did I arrive at my truth? It wasn’t by asking someone else questions that only I could eventually answer! How do I know that? I tried it for many years. When did this belief begin and why? What was their “success” rate? Did they use it themselves? What is believed (claims) about this method (or system) and why? Was it true (fact/science) when it was first introduced/believed? If the system in question can survive this scrutiny, then it can make it to the next level. It is almost always fruitless to argue with someone else about what is best for them or for everyone. Once someone believes something it is hard work to convince them of anything otherwise. Because they are usually invested and have “evidence” , “confirmations”, testimonials or are otherwise convinced about what they believe- yet they may not know why they believe it except that this is what their coach told them what do and they did realize some measure of progress. And even if I know the truth about what works (produces desirable results) for me- does that mean that it “works” for everyone else? If you are reading this- you already know the answer to that. For me there is yet another source of information. Not a popular one because it assumes that we know how to think, and that we apply this ability into processing our methods and conclusions. Yes, it is the Experiment. And whether you want to believe it or not- that is what your coach is doing right now. He or she is trying to figure out what works for you! So you try different things. Oh sure, there is a “blanket” philosophy- and there are “recommended” sets and reps- but if they are smart and want to keep you as a client they are paying very close attention to what is happening in your body and mind as they make their recommendations- because they want to find out what works best so that they can recommend that! So …you can help your coach become an even better coach by giving them detailed feedback because you live in your body and are aware of how you feel more than anyone else. A vector quantity that expresses the relation of the velocity of a body, wave, field, or other physical system, to its energy. The direction of the momentum of a single object indicates the direction of its motion. Momentum is a conserved quantity (it remains constant unless acted upon by an outside force), and is related by Noether’s theorem to translational invariance. In classical mechanics, momentum is defined as mass times velocity. The theory of Special Relativity uses the concept of relativistic mass. The momentum of photons, which are massless, is equal to their energy divided by the speed of light. In quantum mechanics, momentum more generally refers to a mathematical operator applied to the wave equation describing a physical system and corresponding to an observable; solutions to the equation using this operator provide the vector quantity traditionally called momentum. In all of these applications, momentum is sometimes called linear momentum. When it comes to exercise, fat loss, muscle gain—or the Eclipse what if what has already been set into motion is influenced by some outside force such as exercise intensity or calorie control, or a change in macronutrient percentages. Can what has already been set in motion increase speed? If so can momentum morph into “More-mentum”? Frank Ridgway is a friend, client, and colleague. He is a quantum thinker, and it is while exercising and during the course of our conversations that he comes up with some of his witticisms- this is one of them. So I thought I would run with it and use it in my own thinking. Can something good become better? I think so. Can we add to what we already have and increase efficiency? Yes and I think that this is what has happened. As I continue with what was working without forcing things to happen I have actually generated more-mentum! Instead of losing ground. A very important point to ponder. If we continue our behaviors they, in time, will become habits- then they are almost automatic. And as we continue to build we not only compound our efforts we also compound our results. But if we do it all at once or too quick we can overdo it. We first need to have the proper conditioning. One of the critical components of the Eclipse is that it is something that has happened over a period of time- for me that means over 30 years. By continuing, by not giving up we can, (if we don’t do it too quick or all at once) actually increase. Each day I am more encouraged that the Eclipse is possible even though it seems impossible. During my “cardio” time I almost always listen to my thoughts. And this past week the thought that came to me over and over was, “To thine own self be true”. As I meditated on what this message might be- more thoughts came. I knew this was Hamlet but I pondered if there was another application to this old quote. Then a few days ago I was reading an interesting article about Serge Nubret who was one of the bodybuilders of the “Golden Age”. He was being interviewed about his training and his workout methods. I think the writer understood that Serge was saying that his methods worked for him but could this high volume training work for everyone to the extent that it worked for Serge? To me- a similar question would be, would Serge Nubret’s shoes fit everyone’s feet? Probably not- but could I learn something from this as I continue to conduct my personal experiment? Yes, I may find out that this high volume may not allow me to recover from one workout to another. But his physique is so amazing and inspiring. Have you been inspired by something or someone? Then let what they have done and the results they got inspire you to do what you need to do to get what you want. You don’t have to necessarily do what they did. Ask me how I know this! So what was my message? I think it was a confirmation. I must be true to my personal energy levels, my personal energy out put, and above all I must be true to my own personal rate of recovery. Because if I don’t I will go from training and producing results to over training and setting myself up for either diminishing returns or an injury that could put me out of the running. And so will you. What’s important to me particularly right now is what works for me. 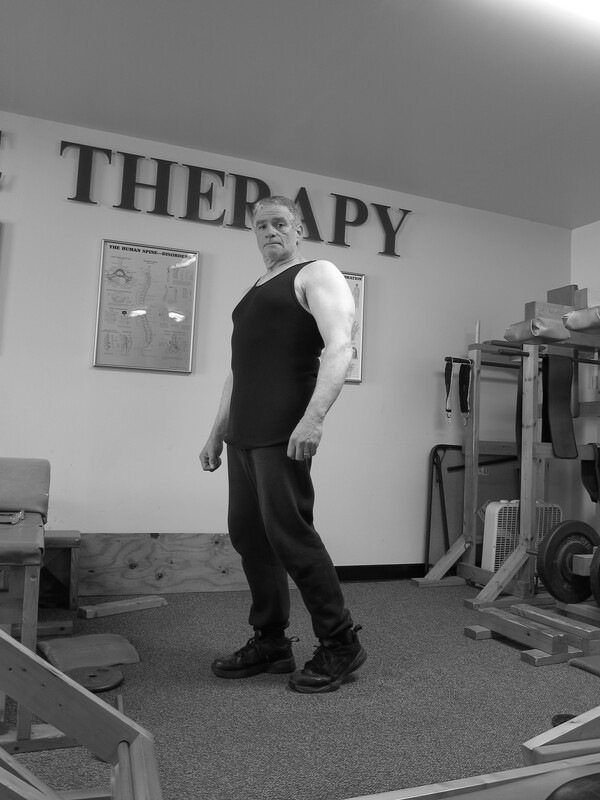 I am not attempting a Transformation- I am attempting The Eclipse– 31 years after the fact which means I need to lose what ever fat and water necessary to keep and display the muscle gained to be able to surpass my condition of over three decades ago. I need to keep the delicate balance between training and over training. I know I can lose weight- but in an all-out effort to lose weight quickly will I also lose muscle? That is exactly what I am trying to avoid so this process is taking a little longer than I expected. OK this thought goes in my Journal. November 19th was official “picture day.” It was a good experience and a new application of some things I already knew. And what was that? one might ask. Several things have come to my mind and I think they are lessons worth sharing. Since my body is not yet where I want it to be, to fully eclipse, I decided not to take official pictures. My intention and plan to peak on the 19th was a “man-made” deadline. I can see that my eclipse, the “impossible,” will take a “little longer” than I originally planned. I remain committed to the outcome. We can plan for an outcome and I think that’s good. We can attempt to force things to happen and that may not be good. Things we decide to do, or deadlines we impose are all man-made. Deadlines like a contest, cosmetic nutrition, training, a certain condition or appearance, are all man-made, or “man” determined. Can we fit our recovery neatly into a 7 day man made week? Can we make pin point accurate predictions about variables that we didn’t know exist or things that are out of our control? The muscles recover when the system has been restored. Period. Competition- whether its figure, bikini, or bodybuilding- it’s all man-made and even when you don’t use drugs the condition one achieves is not normal. In many instances this can mean that this low fat muscular condition may not be healthy or safe- but it does look good to the eyes- even though it will usually only last for one day! How long does it take to achieve this condition and still feel healthy? Each one of us will have to discover that for ourselves. Yes- I know that we can “Transform” our appearance in a matter of weeks- and even then there doesn’t seem to be any guarantee that this Transformation condition can be maintained– unless we know how to. I believe what I am expecting from my body is possible, it will just be a question of time. If we force ourselves to respond to someone else’s program we may experience an injury that will set us back and completely discourage us- which can take us completely “out of the game”. Ask me how I know this. I believe I need to practice “Regret Prevention” by giving my body whatever time it needs to fully recover while I hold in my mind the image of what I want to accomplish. I’m going to have to travel at the speed of Carlos if I am to remain healthy and avoid over training or injury. So I didn’t make my “deadline.” Now what? Have I “failed”? Do I give up? NO! Think about Thomas Edison’s 10,000 experiments to find the perfect incandescent light bulb that would eventually be sold to the consumer and provide light to every household. He never gave up and never considered a “failed” experiment a “failure”! He made many discoveries about what did not work! What if he would have given up? So…No. It’s not a place to be discouraged, or give up. To take a cue from Edison, we now know what did not work. Or took longer to work based on body recovery time. That’s all! He remained committed to the outcome because he didn’t give up on his desire, and neither should we! You too will have to “Stay in your own lane”. So dear reader this quest you are on- it’s really about you. Not what others have done, (whether possible or impossible). It’s not what others have accomplished, how they accomplished it or even how much time it took to accomplish! That information can give us motivation and inspiration. At the end of the day- your quest is about you finding what works for you. I remain committed to the outcome, however long that will take. I hold firmly in my mind the outcome I desire….it is only a matter of time for the “impossible” to be made possible. Watch me! I maintain my current momentum and shoot for my next picture goal date of December 30th for my next attempt. I’m on course, working with my body, and fully committed to the outcome I hold clearly in my mind. We must remember that our man-made deadlines must factor in elements of the unknown and may need adjustment when our goal date comes and goes without having realized our desire. Do we use this as an excuse to not be 100% committed to our current goal date? Do we use it as an “out” for not trying as hard as we can? NO! We do this with integrity. Full throttle, as if there were no other option!